Who Should Fill HBO’s Shoes? 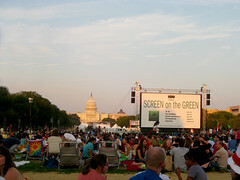 I’m sure you’ve heard by now that HBO has canceled their sponsorship of the famous Screen on the Green summer movie program on the national mall. This is making DC’ers everywhere sad. Which, if you’re an area company, totally leaves room for you to step in and be the hero. This is the perfect PR opportunity to win the hearts and minds of DC for those companies currently on the “Dead To Me” list. That’s right Pepco, with your always-expensive power bills, you could warm not only our homes, but our hearts. Your newfound love of twitter doesn’t absolve you, I want my movies! All that money you made off of us this winter? Give some back, okay? Comcast, I don’t think anything will ever make me love you after our wireless internet “incident”, but I might be more friendly if you saved Screen on the Green. Lerner family, you owe us big time. After withholding rent on the stadium from the city, building the team HQ building RIGHT in the Capitol sight-line, and trying to get DC to pay for the team uniforms, I think you’re due for a little good PR. I don’t know about you, but I’d begrudgingly do the Comcast/Pepco/Lerner family dance if it meant I could watch my movies on the mall again. What company do you think should step up to win back our hearts?